and stamp, your eye looks shy and hushed. the ever moving magic of the mind. you ever needed in the end. May I, also, learn to be this friend. 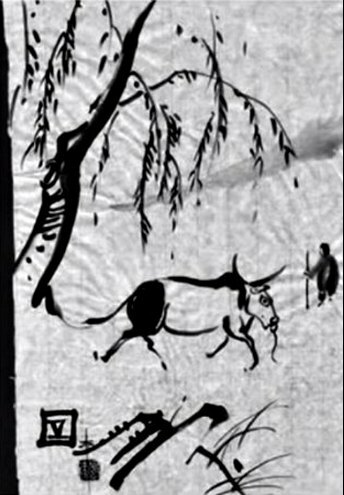 The Ten Ox Herding pictures were first drawn by the Chinese Chán (Zen) master Kuòan Shiyuan in the 12th century, and represent a Zen Buddhist interpretation of the ten stages experienced on the Zen spiritual path. Taming The Ox is the fifth picture in the series. I sit seisa¹ in sesshin². I stop to massage my cushion’s bones. ¹Seisa is a kneeling position for meditators where weight is supported by a cushion or wooden stool. ²Sesshin is a Zen retreat. Dr Nola Firth is an Honorary Fellow at The University of Melbourne whose first poetry chapbook, Even if the Sun, was published in 2013 by The Melbourne Poets Union. She is currently working on a biography of the Rev Dr Barry Marshall. If Taming the Ox is part of the meditation journey, then presumably that means it is yourself you are a friend to? This one makes me teary but i don't know why. Thank you everyone for your lovely feedback. I am very happy that the poems spoke like that to each of you. Christina, I don't remember that particular Doris Lessing book, although i loved her work, but i am glad that is the feeling the poem evokes for you - it is about touching eternity somehow. The friendship in the ox poem is between the restless heart/mind and the deeper self. There are 10 pictures in the original series, each one a different stage and moving further down the path. My mind stilled in so few words; at the outset the drawing providing a reference point, like a goal post for an enquiring mind, the shining soul of the poet unmasked.